Masses of fragrant pink blooms all summer. Perfect for framing pathways, doorways and gateways. Easy to grow, Oleanders thrive on neglect, surviving hot, dry weather or temperatures as low as -5C. Imagine their gorgeous, sweet scent gently wafting through the warm summer evening air. Supplied as a pair of half standard patio trees approx. 60-70cm tall including the 3L protective nursery pot ready to plant out or re-pot. 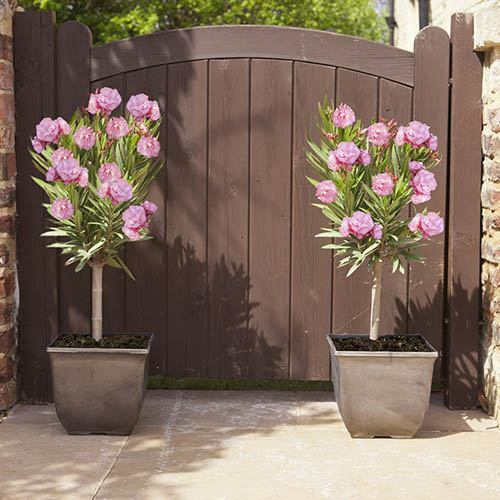 Give your front door, conservatory, patio or balcony a sunny uplifting Mediterranean feel with these breathtaking 2ft tall winter hardy Oleander. Easy to grow, Oleanders thrive on neglect, surviving hot, dry weather or temperatures as low as -5ºC...no wonder it’s one of the UK’s favourite hardy exotics! Gorgeous, sweet scent from their exotic, vibrant pink blooms will gently waft through the warm air in your garden simply delightful in early evenings in the summer. Flowering all summer long, they are wonderfully exotic, yet incredibly they are UK winter hardy to -5C too. These Mediterranean beauties will add height, vivid colour and sweet fragrance to your garden for years to come! Supplied as a pair of 60-70cm tall plants (from the base of the 3L protective nursery pot) ready to plant out or re-pot into a decorative pot.